To serve coffee at the optimum temperature, without losing any of the heat necessary for enjoyment, pre-heated cups are essential. 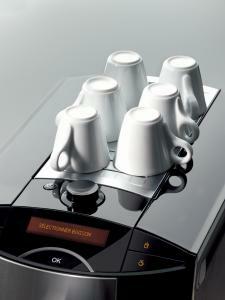 Rather than using hot water from the machine, the CM5100 offers an actively heated cup-rack with space for up to six espresso or three cappuccino cups. For added convenience, the heater can be timer-activated to come on in the morning before you are ready to have your first coffee. 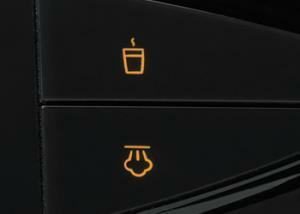 Café style at the push of a button... it’s just that simple. With the CM 5100’s electronic steam/hot water valve, simply select "Hot Water" or "Steam" from the control panel, and you’re on your way to a freshly brewed beverage. 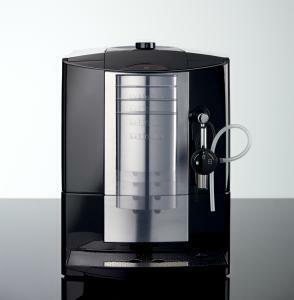 For the best possible coffee aroma, only the best grinding mill is built into Miele coffee machines. The high-quality abrasion resistant steel conical burr grinding mill gives you a smooth, rich brew every time and does so quietly. 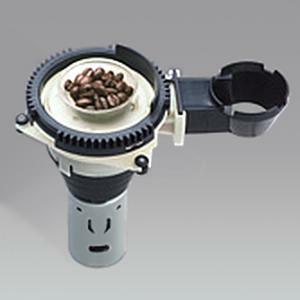 Conical burr grinders crush the beans to a uniform size, creating maximum surface area for a consistent extraction. The unique milling process also helps to release the coffee's aromatic oils. They also don't have to spin nearly as fast; that means quieter operation and less frictional heat, a cause of premature deterioration. The traditional, fresh grind and brew process can easily be bypassed by opening the top of the coffee system and pouring ground coffee into the designated chamber. 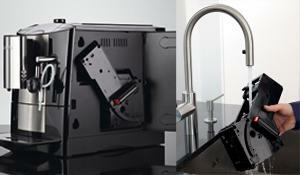 Alternating between caffeinated and decaffeinated beverages, for example, makes this system very versatile. 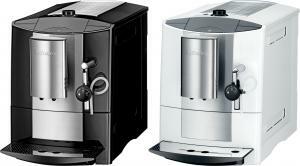 For the perfect coffee aroma, the dynamic Miele brew unit expands when water flows in, allowing the ground coffee and the water to mix more thoroughly. After the brewing process completes and the volume in the brew container decreases, the coffee powder is squeezed and then expelled into the waste container. 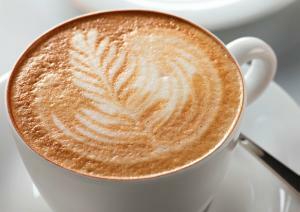 Your benefit: optimum extraction of all of the exciting flavors and aromas that make coffee so irresistible. All functions on the CM5100 can be called up at the push of a button on the clear text display which is ergonomically-angled, giving you the best view at all times. Simply select your favorite drink to start the automatic preparation. The clear text display - plain English with a choice of another 13 languages - will inform you automatically if you need to refill water or beans, or when the waste container or the drip tray is full. The display perfectly matches those of other Miele appliances - design from the same mold to showcase you have a complete and true "Miele Kitchen". 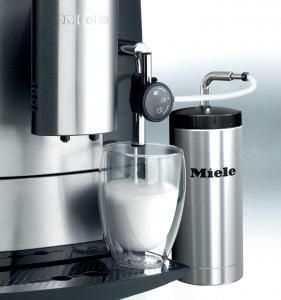 The spout of the Miele CM5100 is fully height-adjustable, giving you enough space for tall latte macchiato glasses. 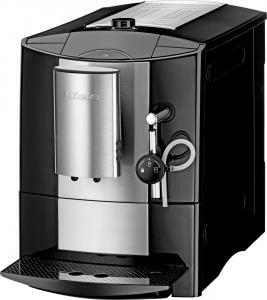 The lowest setting is the perfect height for espresso cups, dispensing coffee without unsightly and heat-dissipating splashing, thus protecting the perfect crema. The brew unit is at the heart of the coffee preparation process. It can be easily removed by hand and rinsed simply under running water, ensuring consistently high quality coffee and a longer lifespan for the machine. 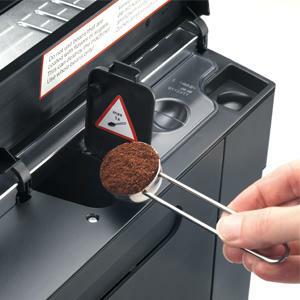 Stray coffee particles and residue can clog the system and potentially, with the warmth and humidity in the machine, develop into unhealthy micro-organisms over time. 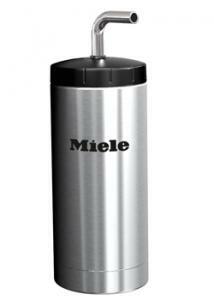 Miele’s insulated milk flask, made of double-walled stainless steel keeps milk cool for up to 12 hours without any loss of quality, and guarantees uniformly perfect steamed milk for cappuccino, latte or macchiato. 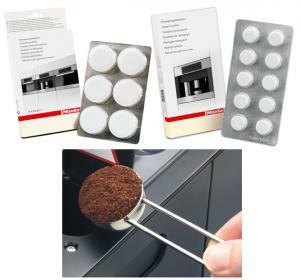 Your CM5100 comes packed with a starting supply of 16 Cleaning and Descaling tablets, as well as a scoop for ground coffee. I must have spoken to customer service 4 times about this order, and each time I received courteous, helpful, and productive assistance. Your customer service is outstanding! I mentioned this to my fiance, and we decided we'll have to stop by your website first when we shop online. Keep up the great work!